Although every room in our current home is painted white, that wasn’t the case in our last house. In fact, not a single room was painted white. Instead, we played up our love for color with a bold palette throughout. 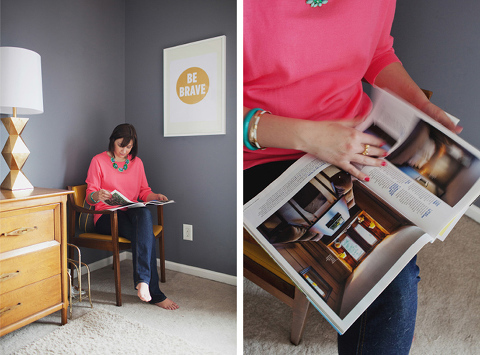 The living room was blue with a yellow-on-yellow accent wall, the bedroom was a deep gray color, and my office studio was painted in a punchy shade of mint green. We might not be as bold with our color choices in this house, but I still appreciate the rich scheme of our old townhouse. I’m even considering the possibility (the possibility!) of painting one of our extra bedrooms something other than white this winter. I know. I’ve gone crazy, guys. 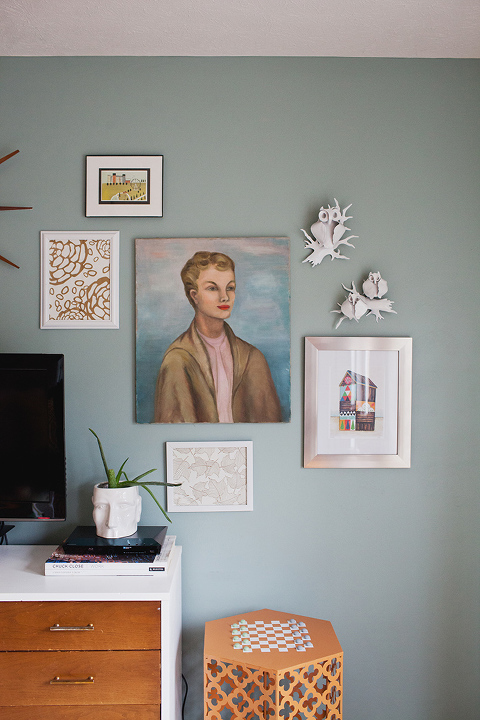 At any rate, I’ve had color on my mind lately, so I thought I’d share a quick list of the non-white paints we loved in our last house for those of you looking to jazz up your own walls this season. 1. 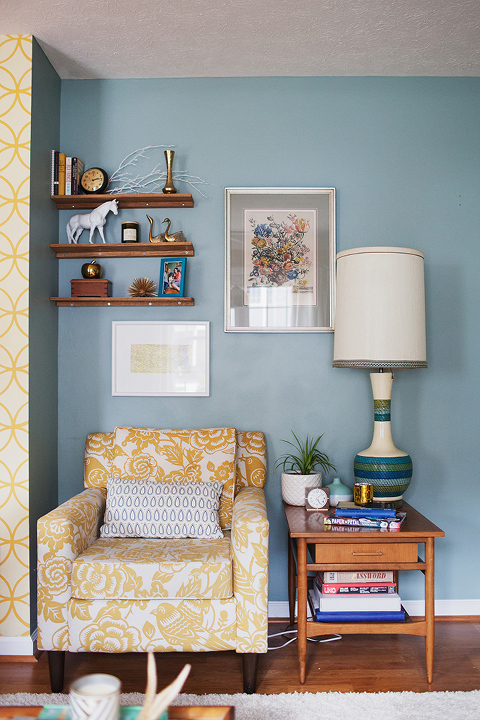 Halcyon Green, Sherwin Williams: We actually totally lucked out with this gorgeous soft blue paint—it was already on the walls when we moved into the house thanks to the previous homeowners. Halcyon Green was the perfect complement to my favorite shade of canary yellow back in the day, and it felt really grown up despite being a pretty intense color. I would definitely use it again in the future. 2. Victorian Pewter, Glidden: The front of our townhouse used to get the most gorgeous natural light, but the back of the house was almost always in shadow. Rather than fight it, I decided to embrace the darkness with this moody gray paint by Glidden. My favorite thing about this wall color is how much art pops when hung on top of it. It’s practically made for gallery walls. 3. 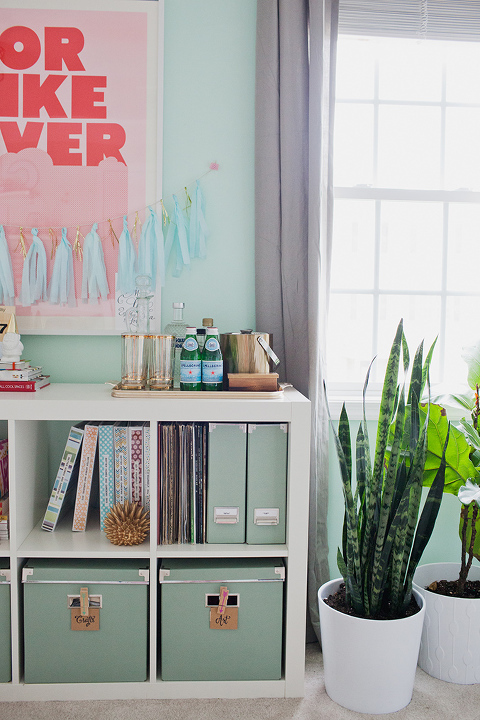 Icy Mint, Valspar: One of the most frequently-asked questions I get on my blog, even to this day, is what the paint color is in my old office. I might not be brave enough to work out of such a brightly painted space nowadays, but I still look back fondly on that youthful, energizing color. If I ever get the urge to go “mint” again, I definitely know which paint color I’ll pick! 4. Rebel, Yule Log, and Ancient Spice, all by KILZ: This is actually the only non-white color combination we have in our current home, as you saw in this tutorial for painting your own faux wood paneling. We’re still just as much in love as ever with the rich wood-look paint treatment, so I had to make sure I mentioned it in my list. So, there you have it—proof that we haven’t always been obsessed with white paint! Do you have a favorite colorful paint that you love in your own home? Please tell us all about it in the comments. As for the paint color I’ve got my eye tentatively on? It’s Hague Blue by Farrow & Ball. This ultra saturated blue/green color has been a favorite among designers for the last couple of years, and I think I might just be ready to give into the trend. What do you think? Too much? For those of you who want to take a trip down memory lane, feel free to hop back here to see what our old townhouse looked like before we moved back in 2015. And if you’re still “Team White Walls,” like us, you can tour our current home here.